The top of the line core router. 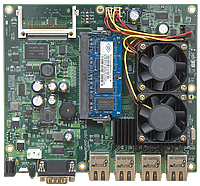 The heart of this device is a new state of the art PowerPC networking processor which makes the RB1000 faster than any other MikroTik product. The IPsec encryption accelerator chip increases the IPsec performance in RouterOS several times. Our tests have shown that it can throughput up to 400000pps or 3.2Gbps total throughput! Two Compact Flash slots for webproxy cache, configuration backups of the User Manager database or The Dude server are also present. and RouterBOARD combined, we bring you the fastest MikroTik router yet.